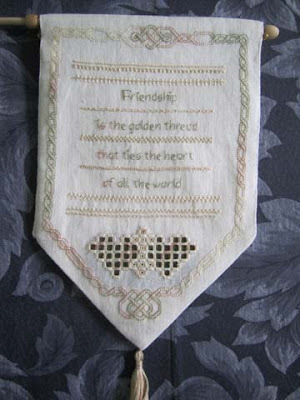 One of the definitions of the word “Retreat” given by The World Book Dictionary is “a retirement, or period of retirement by a group of people . . .” The opportunity to enjoy such a time has been offered to members of the Marigold Guild of Needle Arts each June for twenty-four years. 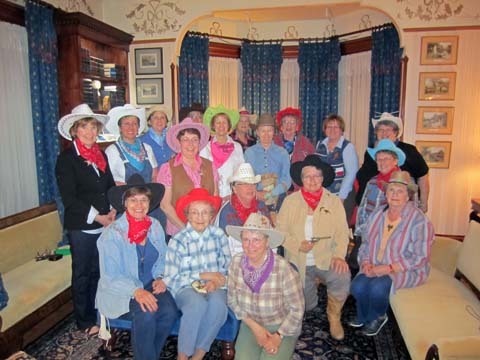 Members make the week-end trek to Victoria’s Historic Inn and Carriage House in Wolfville, NS for a week-end of fun, stitching, laughter, friendship, eating and visiting, all centred around a theme chosen by the hosting team. 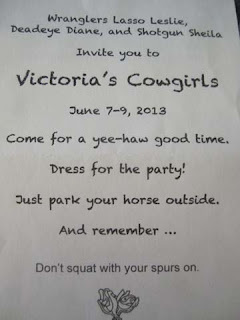 The Theme this past June was “Victoria’s Cowgirls” and was hosted by Lasso Leslie, Deadeye Diane, and Shotgun Sheila. The weekend officially began after supper on Friday evening but most attendees set out early Friday morning to enjoy stops that have evolved over the years: Avonport Discount Fabric Centre (a shop known to every quilter in NS and beyond and a source of Sashiko threads, needles and kits), Tangled Garden to get our supply of herb jellies, Rita’s House of Fashion to check out the latest clothing trends, Gaspereau Valley Fibres to find yarns of all description, and many others. The trip would not be complete without stopping for lunch; the traditional stop is the Evangeline Inn in Grand Pre but many are seeking out the Gaspereau vineyards and the offerings they have. On our beds, we found a fabric bucket fashioned from cowgirl patterned fabric and filled with lots of keepsakes – lots to keep us talking and looking forward to the remainder of the weekend. At the appropriate hour, we gathered at the Chuckwagon, all dressed in Cowgirl hats, vests and boots. We enjoyed Hay Switchel , salsa and taco chips, and iced tea served in mason jars while being entertained by a group local of musicians who came in and shared their music with us. After they left we played games – Cowgirl flavoured, of course; one of the most fun helped us learn all the participants’ Cowgirl names (names like Calamity, Corral’em, Lariet, Jesse, and so on). We also heard a few stories (like the Cowboy who was going to town and his wife asked him to buy some[lady] things for her). 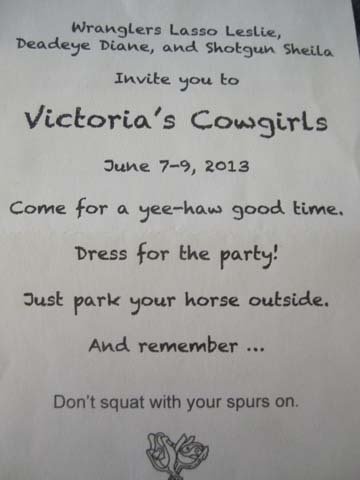 The weekend had other special moments – prizes for everyone, favours (stitched rope scissor fobs, hot pepper jelly, cowgirl boot shot glasses, western recipes, dishcloths folded like a bandana, and others), gift exchange, and the traditional group photo on the front doorstep. But the very best moments were always those when we caught up with each other, when we had time to meet the person inside the stitcher, when we learned and laughed with each other. 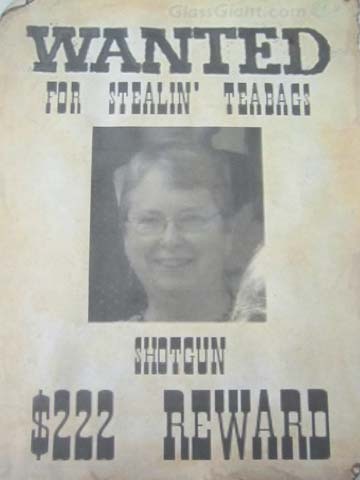 Indeed, our time of retreat was that time of retirement by a very special-to-me group of people! I can hardly wait for next year when we have been invited to enjoy “Victoria’s Silver Jubilee”. Until then, I can visit the Colchester Historeum in Truro and relive the 24 Retreats we’ve had so far – the projects are on display and each has special memories of Retreat for those lucky enough to take the weekend to build friendships and skills. Such fun!! You shore had a rip-roarin' good time!! Your retreats are well known for fun... are there any (or many) members who have not missed any of the retreats?... Lots of work to make it happen.. thanks for sharing. Sheila it sounds like a wonderful time. I am impressed that you have been doing this for 24 years.